Funko BUDDY THE ELF Funko's Multigrain Cereal w/Pocket Pop! Target Exclusive. See pictures for box condition. 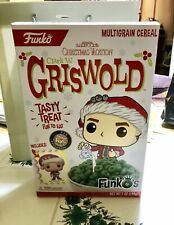 item 2 Funko FunkO's Buddy the Elf Multigrain Cereal Target Exclusive w/Pop Brand NEW! -Funko FunkO's Buddy the Elf Multigrain Cereal Target Exclusive w/Pop Brand NEW!